Have you ever thought of having your applications such as VLC, Winamp, Microsoft Office, Google Talk, extra drivers installed automatically with your default Windows installation? Or, may be you are the Systems Manager for your organisation and you are required to install, say WIndows XP, on your organisations`s systems. Or, may be your organisation wants you to install special scripts on their machines. In such a case, having an auto-installation of all your required applications will really prove to be boon for you as it would save you a lot of time. All that we are talking about is an unattended, complete install of Windows. Come nLite and vLite. 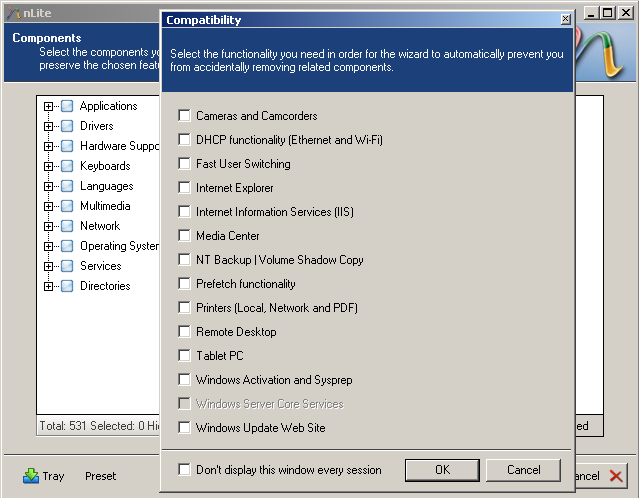 nLite is a tool for pre-installation of Windows, change of configuration and default component removal. With nLite you will be able to have programs which on installation are not included, or are not even included on the installation media and the unwanted components. Some noteworthy features are Service Pack Integration, default Windows component removal, unattended setup, additional driver and codec integration, addition of tweaks and patches. You also have the option to create a bootable iso image.